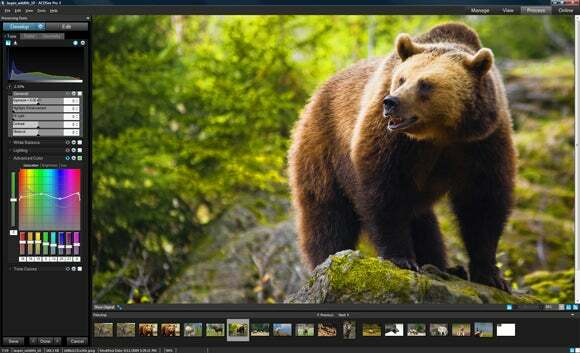 ACD Systems has announced the latest version of its image management software; ACDSee Pro 3. The new software offers improvements on the already-popular previous versions, such as an enhanced user experience and speed capabilities in the editing and online stages. ACDSee Pro 3 combines both non-destructive image editing and precise pixel-level editing into one seamless application. The application also features a new online mode that offers users 2GB of web space for image storage and showcasing. To access a 30-day free trial and for more information on ACDSee Pro 3, visit ACDSee online. ACD Systems International Inc. today unveiled ACDSeeTM Pro 3, a new version of its leading digital image management software that retains the same fast and flexible features photographers rely upon and incorporates an enhanced user experience that delivers professional level workflow tools at a tremendous value. Pro 3 builds on its reputation as a leading viewer, browser and organizer with new advanced speed capabilities in the editing and online stages. For example, the programme’s unique process mode integrates two highly prized features – nondestructive image editing and precise pixel-level editing – into one seamless application. ACDSee Pro 3 provides photographers with the capability to manage digital assets to their own specifications using both folders and metadata. The manage mode speeds the process of browsing, cataloging, retrieving, and presenting collections with flexible time-saving tools. New additions to the robust sharing capabilities allow users to distribute their creative work effortlessly through SMTP-enabled e-mail applications such as GoogleTM Gmail and Yahoo!® Mail Plus, and publish images to their Web sites via a new FTP uploader. As in previous versions of ACDSee Pro, ACDSee Pro 3 supports the management of more than 100 file types and will be regularly updated to support the latest RAW formats as new camera models are released. In view mode, images can be seen in full size at unparalleled speeds. Photographers can quickly scan through selected images with click advance or auto advance features, or flip between images using the new filmstrip window and remain oriented within a large group of files. ACDSee Pro 3’s new process mode integrates nondestructive image editing and precise pixel-level editing into one seamless application. Users can take advantage of the new mode to dynamically adjust images of any format, from RAW files to TIFFs and JPEGs, and easily complete both global nondestructive adjustments and pixel-level editing on any image in one intuitive workflow. Unlike other programmes that make users wait while changes apply, ACDSee Pro 3 allows users to see the outcome of their adjustments in real time. Photographers can easily store and share images online without leaving the application in ACDSee Pro 3’s new online mode, which connects users to a free 2 GB account on the ACDSee Online Web site. The online mode is a convenient way to create, store, share and manage albums and access images when away from the desktop computer. ACDSee Pro 3 image folders can quickly and easily be dragged and dropped directly on the secure, password-protected online storage space. The ACDSee Online site, which is powered by Amazon Web ServicesTM, the same secure infrastructure that backs Amazon.com and its affiliated sites, offers a hierarchical folder tree structure so images can be easily organized. ACDSee Pro 3 is available for a free 30-day trial and for purchase at £99 by visiting www.acdsee.com. Registered owners of ACDSee Pro, Pro 2 and Pro 2.5 are eligible to upgrade at £52.